MINUTES OF 39TH MEETING OF THE BOARD OF TRUSTEES OF APSARA ENGENNARING MILL LTD. HELD ON FRIDAY, 29TH JULY 2019 AT 10.40 A.M. AT THE CORPORATE OFFICE OF THE COMPANY AT 9TH FLOOR, PUSKAR HOUSE, 19, FORT STREET, MUMBAI - 400023. Shri Ram Nath Saha, Director was elected as Chairman of the Meeting and the meeting proceeded with the presence of quorum. 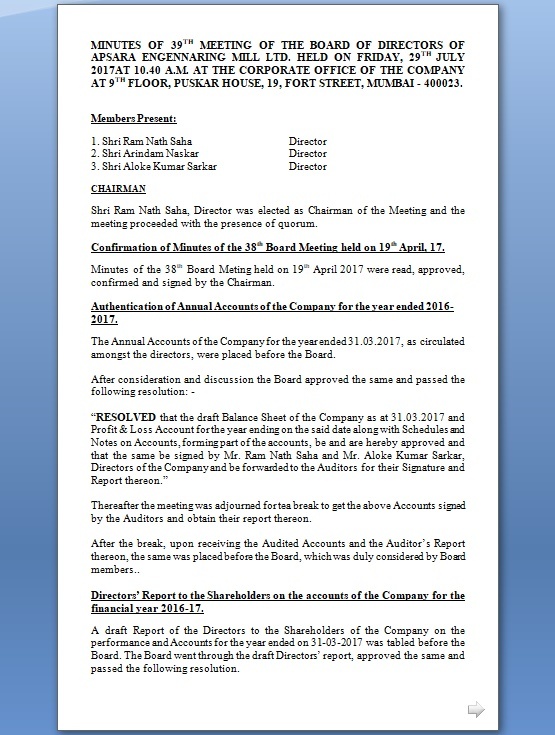 Confirmation of Minutes of the 38th Board Meeting held on 19th April, 17. Minutes of the 38th Board Meting held on 19th April 2019 were read, approved, confirmed and signed by the Chairman. Authentication of Annual Accounts of the Company for the year ended 2018-2019. The Annual Accounts of the Company for the year ended 31.03.2019, as circulated amongst the directors, were placed before the Board. Thereafter the meeting was adjourned for tea break to get the above Accounts signed by the Auditors and obtain their report thereon. After the break, upon receiving the Audited Accounts and the Auditor’s Report thereon, the same was placed before the Board, which was duly considered by Board members..
Directors’ Report to the Shareholders on the accounts of the Company for the financial year 2018-17. A draft Report of the Directors to the Shareholders of the Company on the performance and Accounts for the year ended on 31-03-2019 was tabled before the Board. The Board went through the draft Directors’ report, approved the same and passed the following resolution. “RESOLVED that the Directors’ Report of the Company for the Financial year ended on 31-03-2019 along with annexure, as circulated amongst the directors be and is hereby approved”. “FURTHER RESOLVED that pursuant to Section 215 of the Companies Act, 1956 Mr R.N.Saha, Director be and is hereby authorized to sign the said Directors’ Report on behalf of the Board”. a) The Board decided the date, time and venue of the 9th Annual General Meeting and passed the following resolution. b) The draft notice convening the 9th Annual General Meeting was placed before the Board, which was approved by the Board and following resolution was passed. The Board approved the re-appointment of M/s Swapan Paul & Co as the Statutory Auditors of the Company for the Financial year 2018-17 so that the re-appointment of Statutory Auditors could be considered by the Shareholders at the Annual General Meeting.